Corporate events can take many forms, be it a day away training, or an evening charity dinner, most companies will lay on transport for all staff. Whenever you are required to visit a specific location as a corporate group, then hiring a coach from hireyourtransport.com is the ideal solution. We will take care of all your corporate event transport needs. We provide modern, executive coaches for corporate events, as well as first class double decker buses, all of which are fitted with seat belts, air conditioning, drinks machines, DVD players and toilet facilities. We do our very best to accommodate all your corporate needs. Whether you are looking for coach and bus hire as transportation to and from one place, or to fetch and carry people from various destinations as required, we are highly flexible in our corporate event services. We have a range of transport options available depending on the size of your corporate group. From 40 seaters, right up to a 72 seater double decker buses. Our coaches are in excellent condition, both inside and out, and provide both style and comfort. 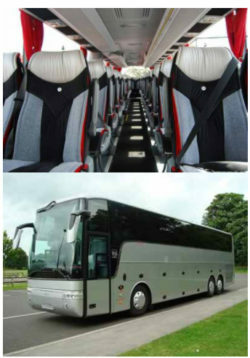 Your company will be well represented arriving in one of our coaches, which are all maintained to the highest standard. Whether you are promoting a product, company or special occasion simply send us a logo or photograph of your campaign idea and our design team will create a visual mock up so that you can see how fantastic your branded bus could look. We can advise on routes to maximise your exposure and get your message around. Each bus has the capacity to carry 60 or more passengers so think big and invite everyone to the party. All hireyourtransport.com drivers are experienced and ultimate professionals, while still providing a friendly and helpful service. Our customer service team are on hand to help you decide what transport option is best for you and also to answer any questions you may have, before, during or after your booking. Whether you are looking to transport company staff between corporate event locations, book a bus for a training day, hire a charter coach for a company corporate party, or a corporate training event or meeting, then look no further than our impressive coaches serving London, and the South East.